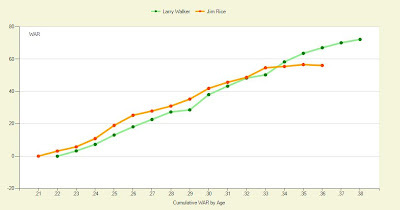 Dave Cameron reminded us again yesterday that we need to spend even more time hanging out at Fangraphs. Like I needed another excuse, Fangraphs is already dominating most of my daily Internet time. I barely even have time to Facebook stalk my ex-girlfriends anymore. But Dave is right, we don't utilize WAR Graphs enough at this site and it's quite the fun tool to have around during the Hall of Fame season. I'll have my ballot posted soon but let's take a look at a simple one right now. I realize that WAR isn't THE perfect stat but for HOF purposes it paints a pretty nice picture for Hall of Fame purposes. Does Jim Rice deserve to be enshrined? No, but that's adorable that you even asked. 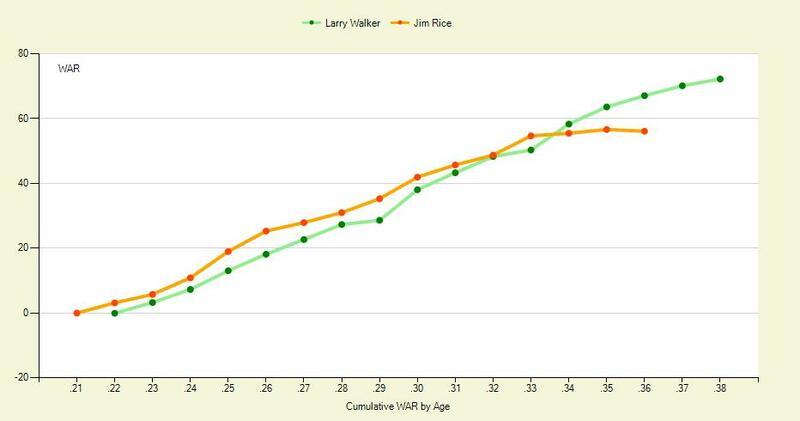 However, what's done is done and if Rice eventually got in, so should Larry Walker. Still don't know what WAR is? Here, I'm not doing all of the work for you.